3564-RBMPU-DST is rated 4.4 out of 5 by 55. 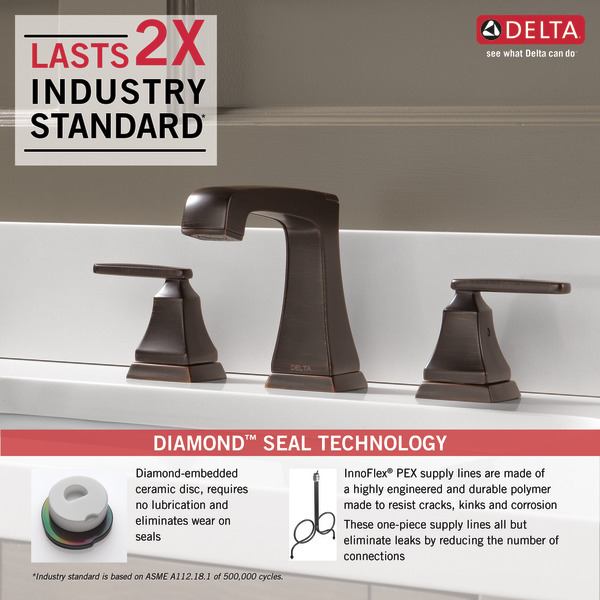 Delta's exclusive DIAMOND Seal® Technology uses a valve with a tough diamond coating. InnoFlex® PEX waterways keep water inside the faucet out of contact with potential metal contaminants. 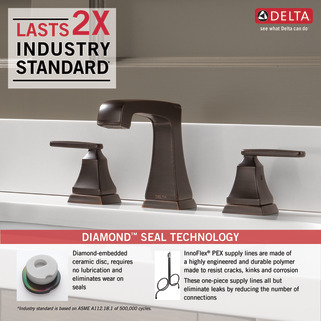 This powerful combination brings you a faucet built to last up to five million uses. Installation is easier than ever with the EZ Anchor® mounting assembly. Secure the faucet from above with no need to go below the deck. 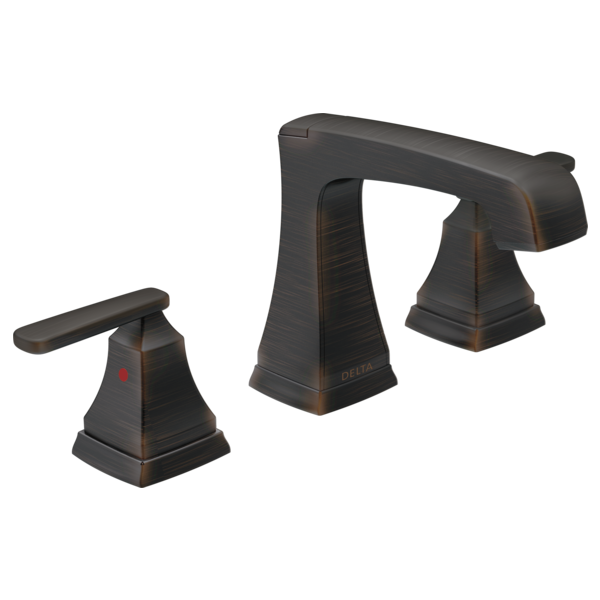 Mounts the faucet tightly to the deck, helping prevent the faucet from loosening over time. Easily installs on decks up to 2-1/2 In. thick, like granite or quartz. 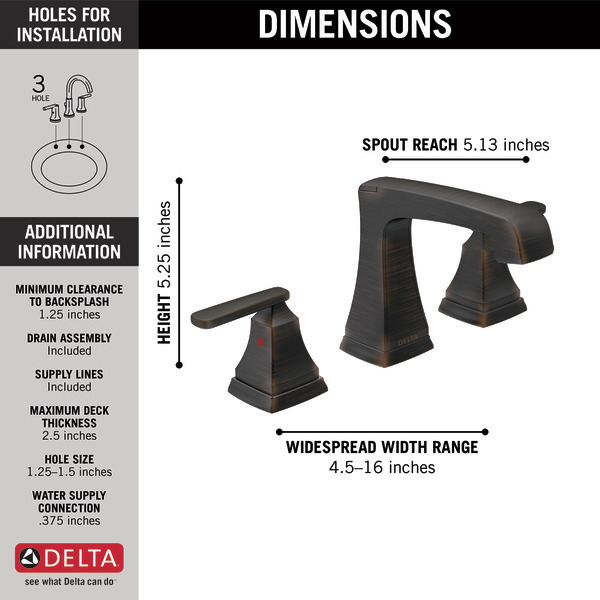 Whether you’re a first timer just learning how to install a faucet or a seasoned installation professional who’s done it a dozen times, save your back and your knees with the EZ Anchor mounting assembly. 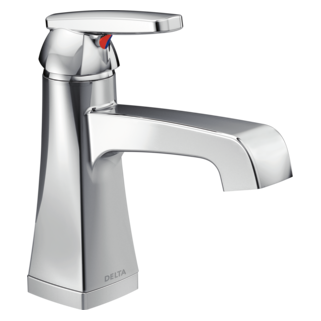 Delta is committed to supporting water conservation around the globe and has been recognized as WaterSense® Manufacturer Partner of the Year in 2011, 2013, and 2014. Rated 2 out of 5 by Connor from Great Faucet.. not so great pop-up drain I purchased 2 of these and I really like the faucets, overall. Problem is neither sink holds water! I have tweaked and adjusted to no avail. Delta says they are not supposed to hold water "that long" but is sending replacements. I will update this review accordingly once I replace the components. Disappointing for a faucet at this price point and as such, I can't recommend an otherwise nice fixture. Rated 3 out of 5 by Congig61 from Great faucet, but the pop-up drains leave a bit to be desired... 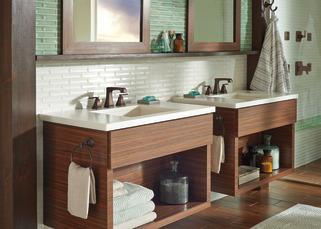 I purchased 2 of these and I really like the faucets, overall. Problem is neither sink holds water! I have tweaked and adjusted to no avail. Delta says they are not supposed to hold water "that long" but is sending replacements. I will update this review accordingly once I replace the components. Disappointing for a faucet at this price point. Rated 5 out of 5 by BILL from Outstanding, just what the Dr. Ordered. Beautiful faucet, easy to install. Well worth the money. Delivery was fast. Would buy again. Thank you. Rated 5 out of 5 by Alngreenwood from Great look I love the look and feel of our new faucet, could not be happier. Also like that the drain is decrectly placed. Rated 5 out of 5 by Shuf from Top quality We did a gut job on the bathroom. Delta makes top notch stuff. This is heavy duty and a design we couldn’t find in the store. Rated 5 out of 5 by Sam15 from Recommending Ashlyn Lavatory Faucet The faucet is beautiful, works well, and was easy to install. 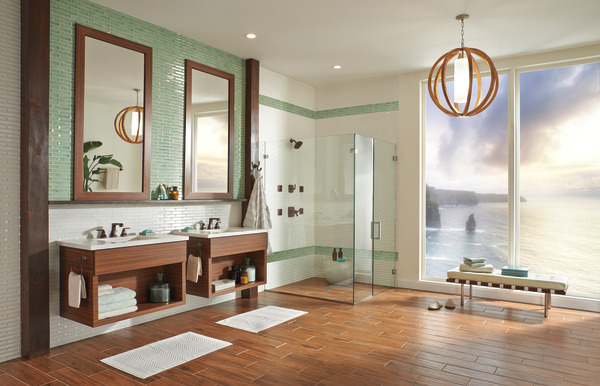 Rated 4 out of 5 by BathroomDesigner from Great Faucet - BUT BEWARE I am a designer with 15 years experience and I specialize in design-build bathroom projects. I am writing this review to tell you that if you choose this faucet, you should figure on also purchasing a push pop-up drain #33W576. 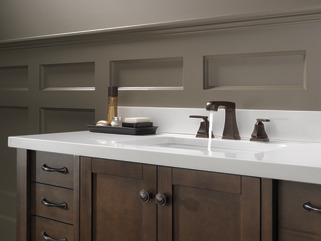 If you choose a sink where the hole for the drain is centered from front-to-back, you will not be able to connect the lift-lever in the back of the faucet to the pop-up drain (the horizontal rod is not long enough). If you purchase the push pop-up drain, you will not need to use the lift-lever on the back of the faucet, thus bypassing the issue. 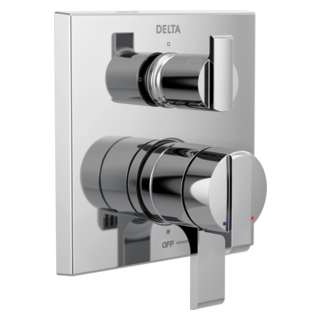 This faucet is great overall and my clients love the design, but it is really unfortunate that Delta doesn't just make the drain's horizontal rod long enough to accommodate a center drain location on the sink. I have spent about 2 hours and $250 just trying to rectify this issue, let alone the plumbers time and the delays to finish this project. 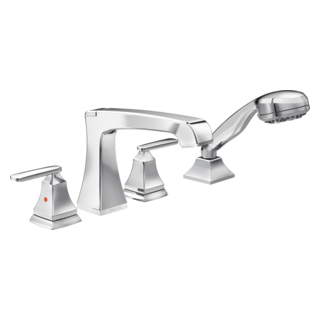 The faucet is beautiful, I just wish we had ordered the touch pop-up drains from the beginning. is there a replaceable airator? what are the dimensions at the base of the escutcheons? I purchased a Delta 3564-MPU-DST with Ez Anchor mounting, but it's missing the spout anchor. How do I go about getting one? Is the Ashlyn bathroom sink faucet made of solid brass or does it have parts made of other metals or plastic? I read the product specifications and it does not answer my question. Wayfair advertises this as being both mini-widespread and as widespread. &nbsp;Can it be installed as a mini? Is the Ashlyn model sold to the big box stores (home depot, lowes, etc), which has the same model # as your website (Model#: 3564-MPU-DST), the exact same configuration/materials as sold to the plumbing supply stores? Is the 2 1/2 inch recommended clearance to backsplash absolutely necessary? I have 1 3/4 because my bs sits on top of the countertop. Will it work? Can you tell me the outside diameter assemble RP 77414, 77417 and 77415 after tightening and cleats are extended? Ashlyn model 3564-ssmpu-dst two handle widespread bathroom faucet with EZ anchor.